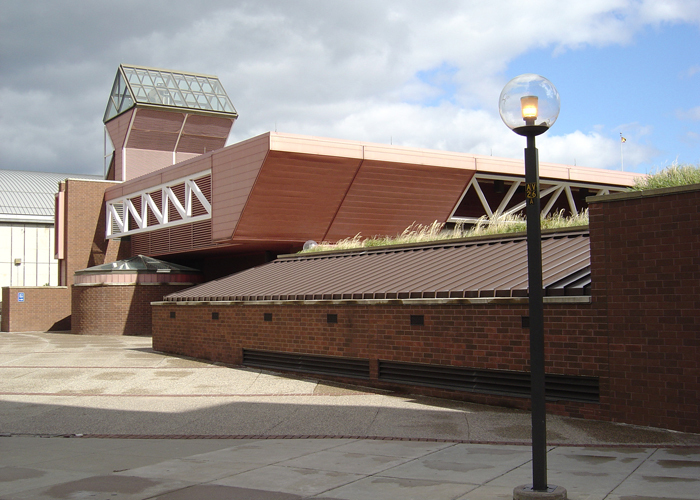 The Civil Engineering building was originally designated by the Minnesota State Legislature as an “energy-independent demonstration project,” conceived in response to the energy crisis of the late 70’s and early 80’s. More than 95 percent of the earth-sheltered building is underground, with classrooms, offices, and laboratories carved from the underlying St. Peter Sandstone geologic formation and some areas of the facility reaching as far as 110 feet below grade. The primary structural system is reinforced concrete. Structural steel was used for the small portion above ground. Large shafts bored through the 30-foot thick limestone “caps” contain stairs and elevators. A significant structural feature is a four-story “structures laboratory,” which accommodates building models and testing of large-scale structural components. 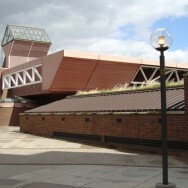 Upon completion in 1983, the building received the American Society of Civil Engineers’ Outstanding Civil Engineering Achievement Award.